My local paper recently published a series of articles lamenting Nova Scotian P-12 students’ performance on standardized math and literacy tests. At issue, reported author Frances Willick, is the use of modern teaching techniques such as “whole-language” learning for teaching reading and “discovery-based” learning for teaching math. Willick’s sources, such as Mount Saint Vincent University (MSVU) education professor Jamie Metsala, say these modern methods have failed kids. Teachers should focus more on traditional techniques like phonics for teaching reading, and repetitive drills for teaching basic math. All of us should welcome robust public debates on pedagogical techniques, and most of us in the education world do. After all, we want to do the best job we can at educating our kids. Unfortunately, “crisis” articles like these are not very helpful. First, they sensationalize what is actually happening in our classrooms; and second, they ignore the political context of what is happening in our education system. Let’s look first at the debate on teaching reading, with the caveat that I am not a literacy expert (although high school teachers do still work on literacy skills, directly and indirectly). Two methods of reading instruction have been used in North American schools over the past several decades. The phonics method consists of teaching letters and syllables as building blocks, which kids learn to “sound out” and use to make words. In contrast, in the whole-language method, the emphasis is on learning whole words and recognizing them in context, analogous to the way children learn to speak. The reading debate isn’t new. This article from 1997 details how heated a political issue it became in California in the early 1990’s, to the point where it influenced a state election. A similar, equally protracted debate exists in mathematics education. Recently, “discovery math” came under fire in Alberta from those advocating a “back-to-basics” approach. A parent started a petition demanding that Alberta get rid of its new math approach, claiming that modern teaching methods confuse kids and demanding more drills on things like multiplication tables. Parents even rallied at the provincial legislature. Here in Nova Scotia, Willick reports that some in the world of math education are concerned about Alberta’s curriculum being imported here. “Back to basics” can be an attractive rallying cry, not least because of its simplicity and appeal to nostalgia. But like many seemingly simple solutions to complex problems, it’s often misguided. “I still remember being taught how to divide fractions in junior high. I was told to flip the second fraction and then multiply. It was a trick that enabled me to get high scores on the tests. Education debates aren’t just about how we teach; they’re about why we teach what we do. What kind of a society do we hope to create and sustain through our public education system? Is it a better world than the one we live in now? Are people in it happy? The answers are reflected in the status we assign to certain academic subjects, but also in how we conceive of the acts of teaching and learning themselves. Modern pedagogical methods like discovery-based math and whole-language reading attempt to look beyond simple mechanics of words and mathematical algorithms and answer questions like: why are we teaching this, anyway? What message does the way we do it send to kids? How can we make them enjoy learning? “Back to basics” is, by and large, a conservative movement: it assumes that the “old way” of doing things worked just fine. It seems to ignore, however, that so many people quite disliked their own school experience precisely because of traditional schooling’s rote-learning, this-is-for-your-own-good-so-suffer-through-it mentality. Modern pedagogy has attempted (albeit not always successfully) to teach things we think kids need to know, while still helping them foster motivation and desire for learning – arguably an inherent trait in humans. Looking at who supports the back-to-basics movement is instructive. 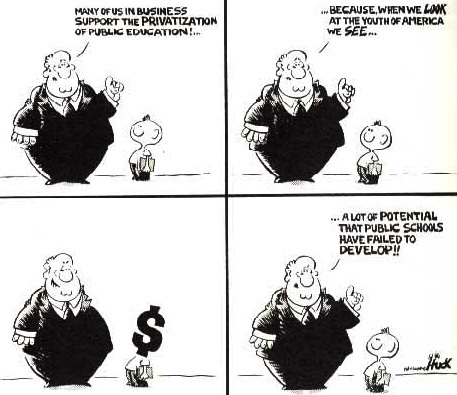 A good example is the Ontario-based Society for Quality Education (SQE), which counts among its board of directors a range of business-types, a former senior officer of the National Citizens’ Coalition (once directed by Stephen Harper) and no one with any apparent on-the-ground experience in public education. The SQE says public schools have a “bias towards progressivism” and “child-centred learning” (horrors!) and trumpets the Mike Harris government of 1995-2003 as a successful model of school reform. The Society is funded by conservative foundations such as the Atlas Economic Research Foundation, and they recently sponsored Florida governor Jeb Bush’s speech at the Economic Club of Canada. Alignment with business interests doesn’t necessarily mean a pedagogical technique is always bad, and just about any teacher (including me) uses them sometimes. But it’s worth looking at how Willick’s stories fit with a narrative common in media reports of public education for some time now. It goes like this: public schools are failing at educating kids. They’re too expensive, and they don’t produce “results” that the job market wants. Therefore, we need to cut “inefficiencies” in the system. And who runs things efficiently? Why, the private sector, of course! The kids in the Chronicle-Herald articles are not getting the attention they need in public school, so they turn to private tutoring companies, which are portrayed as the ones doing things right. To be clear, these companies are doing nothing wrong, but their context is very different to that of a public school – students or parents self-select, and they are not subject to fluctuations in government funding. This is the same narrative which has led “charter schools” – private schools that receive public money and are not subject to all the same curricular and regulatory constraints as public schools – to “compete” with traditional public schools in many parts of the U.S. There are, of course, lots of reasons why schools are different from businesses, and the free-market logic pushed by the business crowd is fallacious when it comes to schooling. In the U.S., while some charters seem to perform about as well as traditional public schools in terms of their test scores and graduation rates, many others perform worse. This is despite the fact that most charters can choose which students to admit, meaning public schools are left with disproportionate numbers of high-needs students. Lack of regulatory oversight means that charters have faced controversy on everything from questionable disciplinary practices to high-level corruption. By no means do public schools get everything right, and we should constantly aim to improve them. But setting up straw men that undermine the very notion of public education helps no one. Society’s expectations of its public education system have changed dramatically in the last century – we know much more about student special needs and mental health issues, and we expect all students to graduate high school, for example – yet we act surprised that costs to education has gone up and that educators seem overworked and unhappy. Improving education goes hand in hand with solving other problems such as economic inequality and systemic racism (and to the Chronicle-Herald’s credit, the final story in its series on Nova Scotia schools examines the very real effects of poverty on student learning).